I joined the practice in 2012 to cover maternity leave but have stayed with the team ever since. 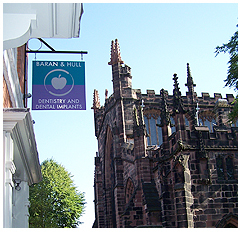 My background is in community dentistry and I lived in Kent before moving here to join the Baran & Hull team. I am qualified in Dental Nurse Radiography and enjoy utilising my IT skills. Recently, my partner and I have renovated our new home and garden. My other hobbies include socialising with friends and family, and occasionally using my gym membership!